Through the autumn and winter of 1948, W. D. Gann hand charted the May 1949 Soybean futures contract traded on the Chicago Board of Trade. 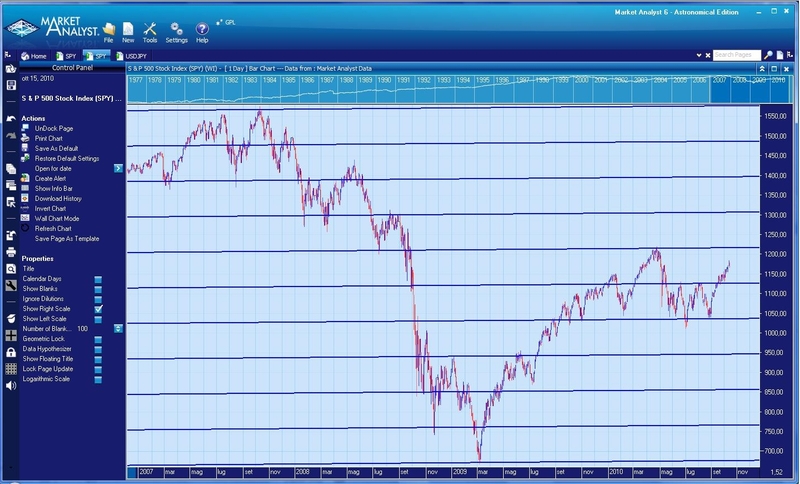 Unlike much of Gann’s work, this chart survived and is publicly available from numerous sources. Many analysts have commented on this chart and a number of them have cited Gann’s use of planetary longitude. I have reproduced it here with certain planetary lines highlighted, as defined by the color key below, showing exactly what each of these lines represents. We can see here that Gann is drawing trendlines and price level lines based upon planetary longitude on this famous chart, and these lines perfectly define the trend as well as the top in the Soybean market. 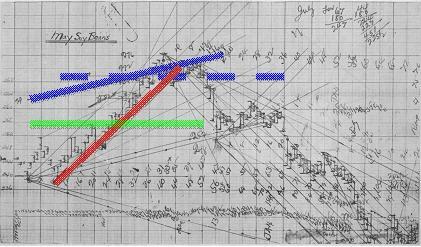 Gann never spoke or wrote in any detail about this technique, and the few references we have to it appear only on some of his most complex and messy charts, having to be deciphered and reverse engineered by the astute Gann analyst in order to determine what he was actually doing. Many people have experimented with using this technique, and Market Analyst 6 Astro Edition includes a function to produce variations of these planetary lines used by W. D. Gann. 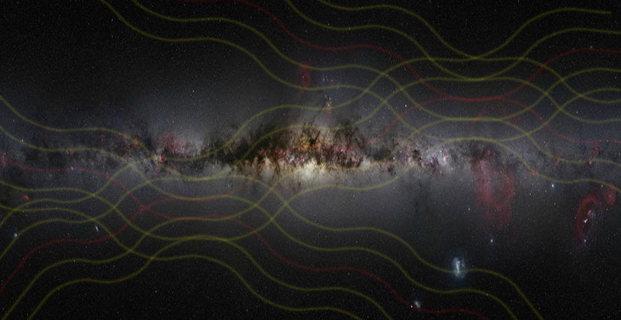 However, often after years of experimentation, researchers are still unable to discover the true potential of this powerful tool, because there is just too much variation in planets, harmonics, settings, and markets to easily make sense of this phenomenon. It turns out that it is not only due to the range of factors that leave most people incapable of applying this technique effectively, but also due to a price and scaling issue. 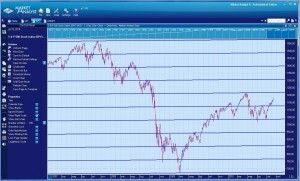 When Gann drew his May Beans chart, Soybeans was trading below 360 on the price scale, so his planetary longitudes could easily be drawn right on his chart using their exact longitudinal values. But in many of our modern markets, prices have gone through many multiples of a $360 price scale, and when trying to apply planetary lines to these new scales, the lines skew and do not provide the effective insight that they did for Gann above. This has been the issue that has led so many analysts to fail in finding a real use for this tool. What is needed is a calibration factor which realigns these Key natural planetary forces to different markets with different price scales, so that the planetary lines can be usefully plotted on modern day markets. I have come across only one person who has resolved this problem, Daniele Prandelli, who in his new trading course, The Law of Cause and Effect, solves the puzzle of Gann’s Planetary Price Line technique, by developing a mathematical offset factor, or calibration rate, through which powerful and effective planetary lines can be laid out on any chart, in any market, showing important price and time trigger points and support/resistance levels, which the market moves between as if it were pushed and pulled by some kind of magnetic force. Without the use of this conversion factor one can put planetary lines on charts all day long, but they do not give accurate or consistent results that one can count on. The endless variations between the aspect harmonics can overload a trader with so much information that it all becomes essentially useless, unless one understands how to mathematically calibrate these lines with each particular market. When this is properly done, the planetary lines serve as a kind of lattice or grid work through which the market moves in a predictable and tradable manner. 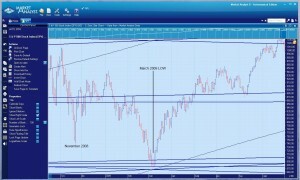 The following example shows the S&P500 Index from 2007 to 2010 with only one planetary influence, shown by the blue lines. Notice how the market just bounces between these blue planetary lines, and particularly how the extreme tops and bottoms find their reversal points exactly upon, or very close to these pre-determined price levels. This is because planetary price lines act as Magnetic Attractor Fields which draw the market to them, then push them away again, giving a trader a map of the geometric, electro-magnetic lattice that the market is influenced by. In the same way that electrons jump between orbital levels, the market will vibrate between these zones defined by planetary resonance. The prior example showed only one planetary influence overlaid on the chart, but there are other important planets which will determine other important levels, providing confluence points between the lines for stronger indications. For example, on the following chart we are zooming in on the same chart and adding some other planetary lines, in order to observe how a confluence of multiple lines can give us an even clearer indication of an important bottom in the market. This low is the same major bottom from the last chart. Notice that with the addition of other resonant planetary lines at this March 2009 Low, there was not just one line that confirmed this Key turning point, but a huge confluence of multiple lines, the first lines creating the initial resistance from the precipitous drop, with the final Low falling EXACTLY upon the resonant confluence of 3 different planetary lines! Another fascinating element of this technique is that it will demonstrate that the markets are controlled by natural order, even at times where people think there was random error. The following chart illustrates the influence of the planetary lines on a move that was considered by main-stream media to have been caused by a “trader” or “computer” error, causing the S&P 500 to plummet 100 points during the day’s trading session (with the Dow falling about 1000 points that day in intraday trading). As can be seen above, the low of that day touched EXACTLY upon the confluence of two overlapping planetary lines! After seeing this, how can anyone believe that the markets are merely random? Traders who understand these techniques KNOW there is no random movement in the markets, and are well poised to take advantage of such seemingly chaotic events! As I mentioned, the Astro Edition of Market Analyst has the function to apply these planetary lines on the charts, as well as a further vast resource of Gann and planetary tools that are quite valuable for research and trading. Of course, the planetary line tool in Market Analyst does not set the calibration factor that makes the lines work on different markets, though it has the ability to enter this calibration factor in the tool. To learn how to determine and use that factor in different markets, I must refer you to Daniele Prandeli’s course, The Law of Cause and Effect: Creating A Planetary Price-Time Map Of Market Action Through Sympathetic Resonance. Prandelli is also listed on the Market Analyst site in the Educator’s section, so you can check there for more details on how to learn to properly use this tool in Market Analyst. It is a simple fact that the overlay of these powerful planetary price techniques upon any chart adds an extra dimension to one’s market vision and trading indications, giving a profound insight into the forces behind real market action. Whatever trading tools you may use, the addition of the Gann’s planetary lines will provide a significantly deeper insight into the true cause of market reversals! We have no doubt that, once understood, no trader will ever again place a trade without consideration of these essential planetary price lines.